Since the birth of 70000TONS OF METAL, The World’s Biggest Heavy Metal Cruise, our official discussion forum has been the ultimate destination for many of our survivors to discuss, critique, and praise 70000TONS OF METAL and more. THE BRIDGE is THE online forum where survivors have the opportunity to meet new cruisers from around the world, long before we set sail. Don’t want to sail alone? Our forum’s RECRUIT A CABIN MATE section is the place to go! Like it loud? Hang out in the ENGINE ROOM to discuss all things Metal! If that’s not enough, go OFF COURSE to discuss everything else! Why are you reading all of this? 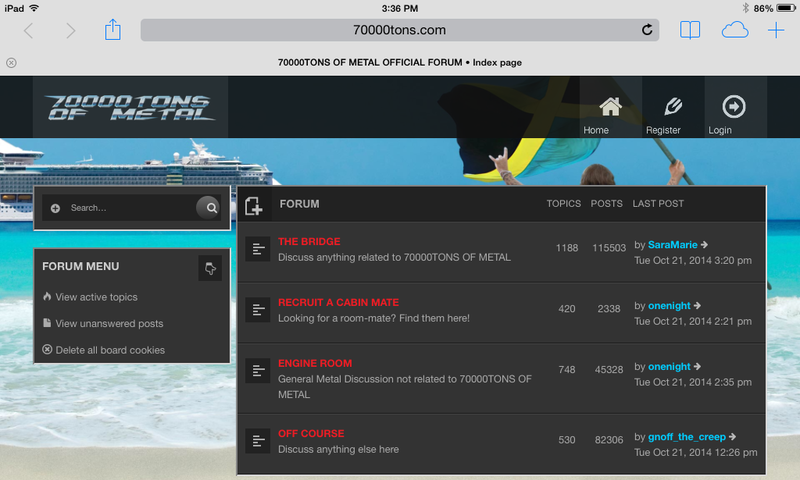 Because as of today the official 70000TONS OF METAL discussion forum is mobile friendly! ← 100 Days To Departure!